E-Cigarettes, also knowns as “vape pens”, “vaping devices” or by the brand names such as “Juul”, are electronic devices that deliver aerosolized chemicals including nicotine (often called “e-juice”) by inhalation. Teens often refer to this action as “vaping” or “juuling”. While these devices can occasionally appear like traditional cigarettes or cigars, they most often look like pens or technological devices such as USB drives. 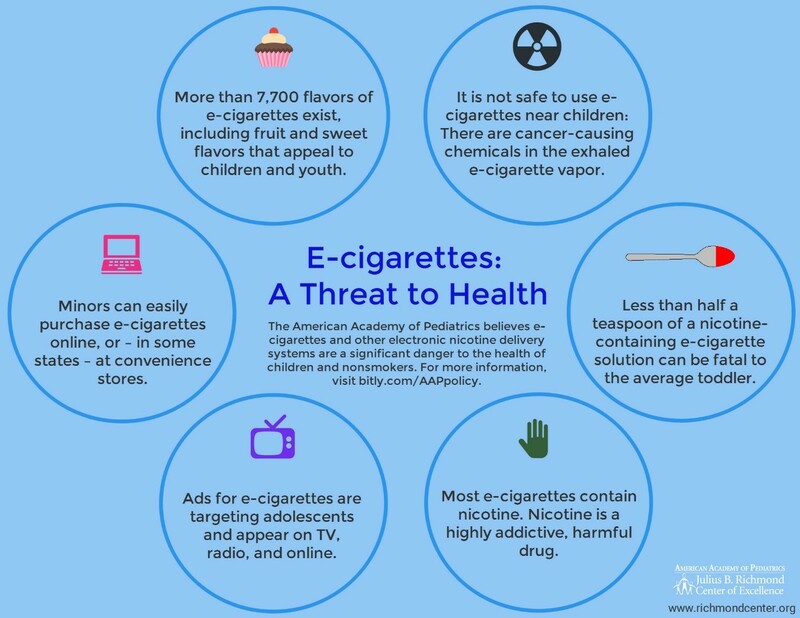 E-cigarettes are often small and discreet and the vapors do not produce any odor, so they are easy to hide and use without the knowledge of teachers, parents, or other adults. This also makes them easier to use and actually encourages more frequent use – with kids and teens often using e-cigarettes in bathrooms or stairwells or even classrooms multiple times during the school day. Though the law requires persons to be over 18 to buy e-cigarettes and e-juice, these products can often be purchased online. E-juice can be purchased in bottles or pods that come in a variety of flavors that appeal to children and teens such as mango, bubblegum, gummy bear, piña colada, chocolate, and mint. Almost all e-cigarettes, including Juul, contain nicotine. In fact, a single pod for a Juul contains double the amount of nicotine as other e-cigarettes and as much nicotine as a pack of cigarettes (though tobacco experts argue this could be an underestimate). Nicotine is a very addictive and harmful chemical for the developing adolescent brain and increases their risk for other addictions later in life. Use of e-cigarettes has also been shown to increase the likelihood that adolescents will start smoking traditional cigarettes. The vapor in e-cigarettes can include chemicals such as anti-freeze, diethylene glycol, and carcinogens like propylene oxide, acrylamide, acrylonitrile, and crotonaldehyde. The fruit flavored e-juices are more likely to contain some of these compounds, which is especially dangerous for teens. Additionally, the concentrated nicotine in the e-juices can be very dangerous and potentially fatal for young children should they ingest or even touch the liquid. Children under the age of 5 are especially at risk for nicotine poisoning if they are exposed to even as little as half a teaspoon of the concentrated nicotine. Be sure to keep all e-cigarettes and liquid nicotine products locked and out of the reach of children.